NUTROTM Adult Wet Cat Food Chunky Loaf Chicken Dinner is made with real chicken as the #1 ingredient and fulfills the unique nutritional needs of your cat. 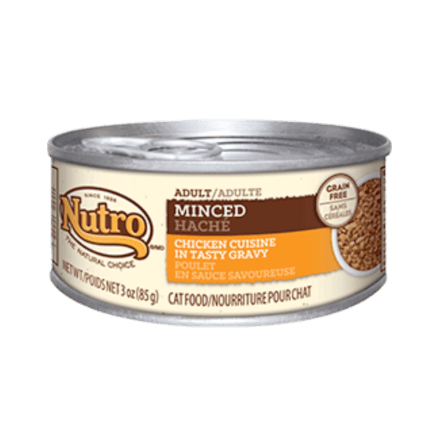 While providing a great taste, our canned chunky cat food has a soft, lap-able texture that’s easy for cats to eat. Plus, it provides the right mix of proteins, fats and carbohydrates so you know you’re providing the nutrition your cat deserves. Chicken, Chicken Broth, Chicken Liver, Pork Broth, Natural Flavours, Guar Gum, Sodium Phosphate, Fish Oil (preserved with mixed Tocopherols), Minerals (Calcium Carbonate, Potassium Chloride, Ferrous Sulfate, Zinc Oxide, Copper Proteinate, Manganese Sulfate, Sodium Selenite, Potassium Iodide), Salt, Vitamins (Choline Chloride, Thiamine Mononitrate [Vitamin B1], Vitamin E Supplement, Niacin, d-Calcium Pantothenate, Pyridoxine Hydrochloride [Vitamin B6], Vitamin A Supplement, Vitamin D3 Supplement, Biotin, Vitamin B12 Supplement, Folic Acid), Taurine. To feed alone: Feed an 8 lb. (3.6 kg) adult cat about 2 cans daily. 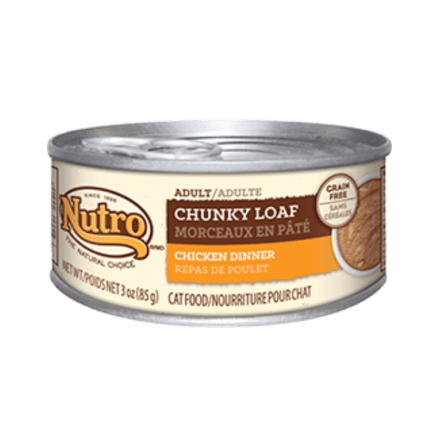 NUTRO™ Adult Chunky Loaf Chicken Dinner Wet Cat Food is formulated to meet the nutritional levels established by the AAFCO Cat Food Nutrient Profiles for maintenance.